[134 Pages Report] The global Crystalline Polyethylene Terephthalate Market is projected to reach USD 12.16 Billion by 2020, at a CAGR of 9.0% from 2015 to 2020. The food packaging application segment is projected to account for the maximum share of the Crystalline PET market. This market has been segmented on the basis of by application and region. For company profiles in the report, 2014 has been considered. Where information is unavailable for the base year, the prior year has been considered. This research study involves extensive usage of secondary and primary sources. Secondary resources include directories and databases (such as Hoovers, Bloomberg, Businessweek, Factiva, and OneSource) to identify and collect information useful for this technical and market-oriented study. The below explain the research methodology. 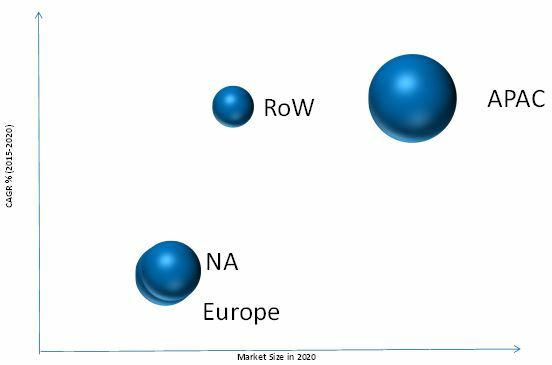 After arriving at the overall market size the total market has been split into several segments and sub-segments. The figure below shows the break-down of the primaries on the basis of company, designation, and region, conducted during the research study. The ecosystem of the value chain of the global crystalline polyethylene terephthalate market starts with material suppliers. It includes many small and large chemical companies, such as BP Chemicals Ltd. (U.K.), CAPCO (Taiwan), DAK Americas, LLC (U.S.) DuPont (U.S.), Eastman Chemical Company (U.S.), Ibn Rushd (Saudi Arabia), and Koch Industries, Inc. (U.S.), among others, who provide raw materials, such as terephthalic acid (TPA) and ethylene glycol (EG) to the manufacturers of crystalline PET. These manufacturers develop various grades of crystalline PET through the extrusion and blow molding process and supply it to a number of end user industries including, food packaging, beverage packaging, pharmaceutical, and automotive. This research report categorizes the global crystalline polyethylene terephthalate market on the basis of application and geography along with forecasting volume, value, and analyzing trends in each of the submarkets. Each type is described in detail in the report with volume and revenue forecasts for each application. The global crystalline polyethylene terephthalate market is projected to reach USD 12.16 Billion by 2020, at a CAGR of 9.0% from 2015 to 2020. The food packaging application segment of the market contributed a major share to the market with increasing demand for beverages. The report covers the crystalline PET market across major geographical regions, including Asia-Pacific, Europe, North America, and the rest of the world (RoW). The growth of the packaged food industry is expected to fuel the growth of the global market for crystalline PET in the coming years. Furthermore, the factors, such as the physical characteristics of crystalline PET including its strength and stiffness, clear appearance, lightweight, low flavor absorption, and favorable creep characteristics, along with low price makes it ideal for usage in various applications. The increased usage of crystalline PET in various applications is also driving the global crystalline polyethylene terephthalate market. The Asia-Pacific region accounted for more than one-third of the global demand for crystalline polyethylene terephthalate. The increased usage of crystalline PET across different industries, such as cosmetics, films & sheets, and food and beverages packaging is expected to boost its demand in the emerging economies, such as India and China. This has made the Asia-Pacific region, a global manufacturing and commercial hub for crystalline PET, where several major companies are setting up their plants to target the high-growth segments of the region. Cheap labor and easy availability of feedstock are some of the key factors that have been attracting manufacturers to establish their manufacturing facilities in this region. The key market players operating in the global crystalline polyethylene terephthalate market have adopted expansions, mergers & acquisitions, supply contracts, new product developments, and innovations as their key strategies to meet the increased demand for crystalline PET as well as to penetrate the market. Some of the major companies operational in this market are Eastman Chemical Company (U.S.), Bayer MaterialScience AG (Germany), La Seda De Barcelona (Spain), Petrotemex S.A. de C.V. (Mexico), Quadrant (Switzerland), Indorama Ventures Public Limited Company (Netherlands), and DAK Americas LLC (U.S.), among others. Fluctuating prices of raw materials is the major restraint for crystalline polyethylene terephthalate market. Raw material prices are highly dependent on crude oil prices which results in the higher pressure on crystalline PET manufacturers. Indorama Ventures is the most dominating player in the crystalline PET market. It is one of the largest manufacturer of PET resin in the world and continuously involved in research and development, new product launches, and expansions. 10.10 Petrotemex S.A. De C.V.